Lillie’s Q, the critically acclaimed Chicago-based restaurants known for its barbecue and Southern side dishes, will be opening an Orange County location in 2014. The venue, which will be located in downtown Brea, is slated to open for lunch and dinner service. In addition to serving up Southern cuisine and barbecue entrées, such as slow-smoked pork shoulder, baby back ribs and tri-tip, the venue will also partner with neighboring restaurant TAPS Fish House & Brewery to feature specialty craft beers created by the latter eatery’s brewmaster Victor Novak. Lunch & Dinner daily. Lillie's Q, 240 S. Brea Blvd., Brea, CA 92821, no phone. The Fireside Tavern, the flagship restaurant of the newly remodeled Crowne Plaza Costa Mesa Orange County hotel, is now open for breakfast, lunch and dinner. Executive chef Scott Brandon, who was previously at The Crow Bar and Kitchen, oversees a menu that features contemporary American gastropub-style cuisine, ranging from burgers and salads to meat and seafood entrées. The venue’s lengthy bar also features signature cocktails, craft beers and California wines. Breakfast, Lunch, & Dinner daily. Fireside An American Tavern, Crowne Plaza Costa Mesa, 3131 S. Bristol St., Costa Mesa, CA 92626, 800-972-2576. Balboa Bay Resort, the sprawling hotel and club located along Newport Harbor, has announced the opening of their new flagship restaurant, Waterline. The waterfront venue’s chef-driven, “water to table” concept highlights Southern California-inspired takes on seafood as overseen by executive chef Vincent LeSage. The restaurant will also feature contemporary cuisine, a breakfast and lunch menu, a Sunday brunch buffet, and a full bar overlooking the city’s famous marina. Breakfast, Lunch, & Dinner daily, Brunch Sun. 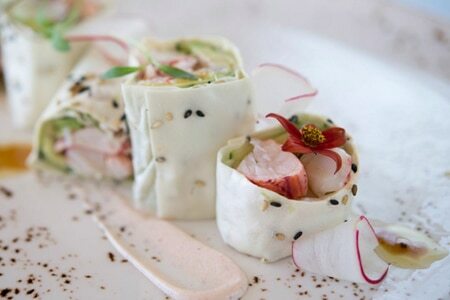 Waterline, Balboa Bay Resort, 1221 Coast Hwy, Newport Beach, CA 92663, 888-894-2788. The Winery Restaurant & Wine Bar has opened up their highly anticipated sister location in Newport Beach. Located along the waterfront in the city’s revitalized Mariner’s Mile district, the restaurant features executive chef Yvon Goetz’s take on contemporary California regional cuisine set against the legendary backdrop of Newport Harbor. In addition to offering dinner service, the two-story venue features a second-floor outdoor dining patio, two private dining rooms, and two bars featuring the restaurant’s long list of wine selections culled from appellations around the globe. Dinner nightly. The Winery Restaurant & Wine Bar, 3131 West Coast Hwy., Newport Beach, CA 92630, 949-999-6622. TAPS Fish House & Brewery, the Brea restaurant known for its seafood and its craft beer will be opening a second Orange County. The location is slated to open at The Market Place in Irvine in early 2015. The restaurant will be featuring a 150-seat private dining room, a large outdoor patio and 25 tap handles of craft beer, including a half-dozen of TAPS’ award-winning brews. TAPS Fish House & Brewery, 101 E. Imperial Hwy., Brea, CA 92821, 714-257-0101. El Corazon de Costa Mesa has temporarily closed. The restaurant, which was located in the city's recently renovated Triangle Square, was purchased by the owners of fellow shopping center resident, Sutra Lounge, who plan to reopen the restaurant after giving it a rebranding. El Corazon de Costa Mesa, The Triangle, 1870 Harbor Blvd., Costa Mesa, CA 92627, 949-612-2349.